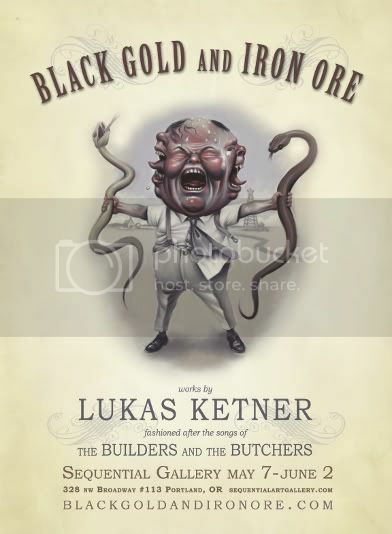 Check out the new website dedicated to my upcoming solo show titled "Black Gold and Iron Ore". The artwork is fashioned after songs by The Builders and The Butchers. It will be on display at Sequential Gallery from May 7th, 2009 to June 2nd 2009. "Portland Center for the Performing Arts, the Stumptown Comics Foundation & Sequential Art Gallery present COMICS TO THE PEOPLE! An Exhibition of Comic Book and Cartoon Art, featuring Stumptown Comics Fest artists. This is the second year PCPA has collaborated with Stumptown Comics Foundation to exhibit a sampling of work being produced by comic book professionals, ranging from industry veterans to emerging talent. COMICS TO THE PEOPLE! boasts 27 artists & 83 pieces of art. There will be an open reception on First Thursday, April 2nd, from 6-9pm in PCPA's ArtBar, with several of the artists in attendance. The exhibition is available for viewing throughout April and May, during all of PCPA's normal hours of operation."